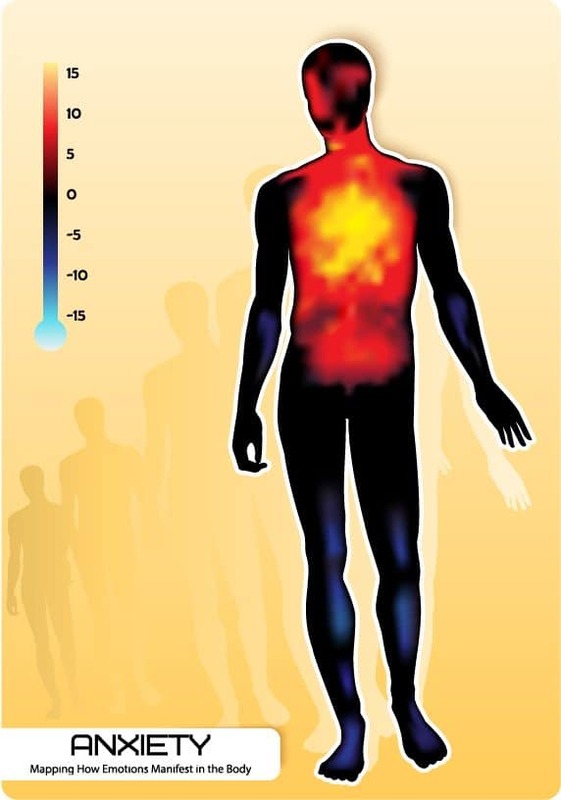 What if you could see exactly where you feel certain emotions in your body? Well, now you can! 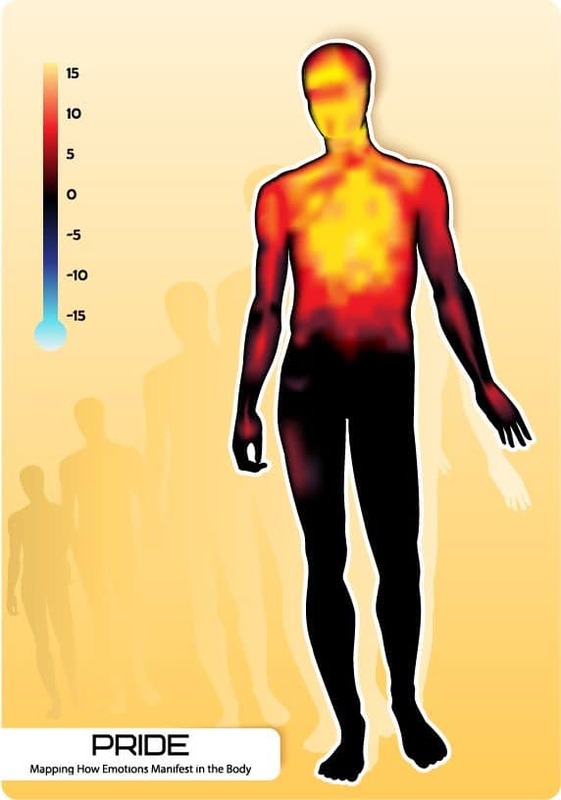 Enter heatmaps. A study performed by scientists in Finland shows how and where we feel emotions within our bodies, which could have implications on the treatment of mood and emotional disorders. “We often think the emotions are something that happen only in the mind, but there’s also lots of evidence suggesting that they also happen in our bodies,” says lead author Lauri Nummenmaa of the Aalto University School of Science in Finland in an interview by NPR. The study was published in the Proceedings of the National Academy of the Sciences and consisted of five experiments that included 701 participants. Researchers showed them two silhouettes of bodies on a screen and asked the volunteers to think about one of 14 different emotions, including love, anger, pride, sadness, etc. Then, they asked the volunteers to paint areas of the body where they felt the emotions on the first silhouette, and on the second silhouette, shade in parts of the body where they felt the emotions become deactivated. Contempt mostly activated areas of the head, neck, and chest, while the rest of the body remained neutral. We can speculate that since contempt means looking down upon someone or feeling that they’re beneath consideration, this boosts our own ego, which literally can get to our head if left unchecked. Shame caused much of the same areas to become activated as contempt, though emotions were felt a bit lower in the abdomen. Interestingly, people’s emotions became deactivated in the lower legs. It’s no surprise that people reported feeling pride in their upper body, specifically in their head and chest. 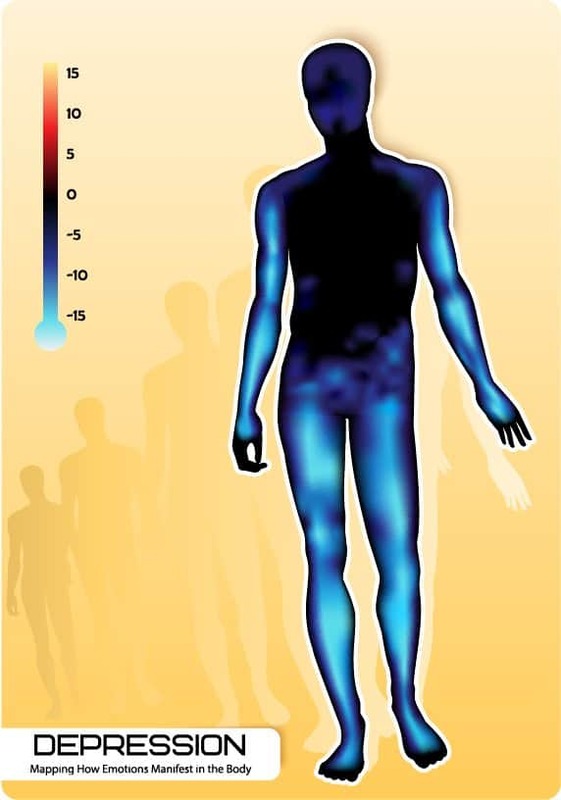 Pride is a positive emotion and releases feel-good chemicals throughout the body. It’s also not a surprise that people reported decreased activity in the body when depression came to mind. 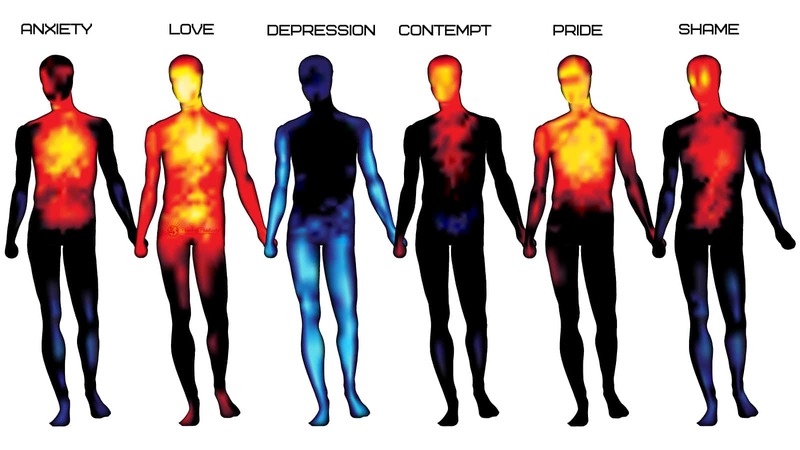 Depression has a numbing effect on the body and looks virtually opposite of love and happiness on heatmaps. We hate to end on a sour note, but anxiety is an important emotion to discuss. 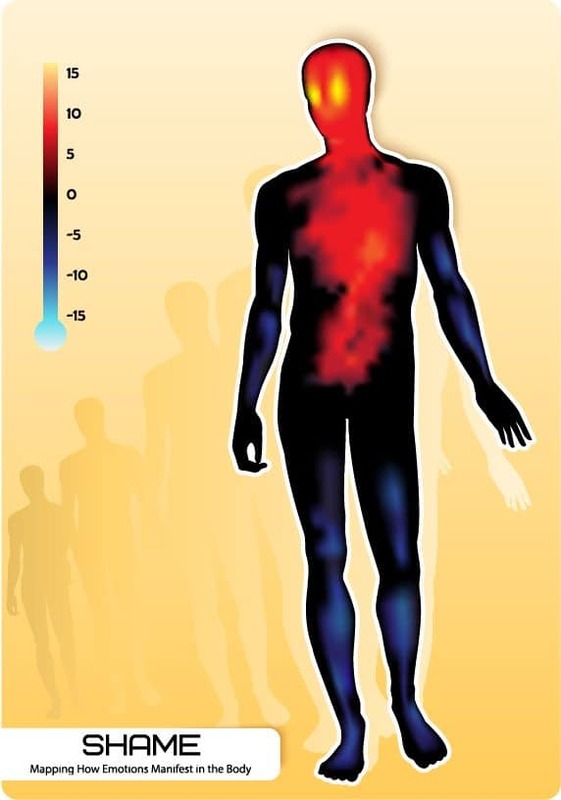 According to the heatmaps, anxiety was felt mostly in the chest. This makes sense because our hearts speed up greatly when we sense a threat, whether real or perceived. For a quick recap, happiness and love increased activity across nearly the whole body, while depression decreased activity, especially in the arms, legs and head. 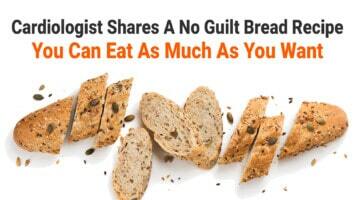 Sadness also had a numbing effect, though not nearly as pronounced as depression. Danger and fear triggered strong reactions in the chest area, which makes sense because the fight-or-flight response speeds up our heartrate in response to a threat. 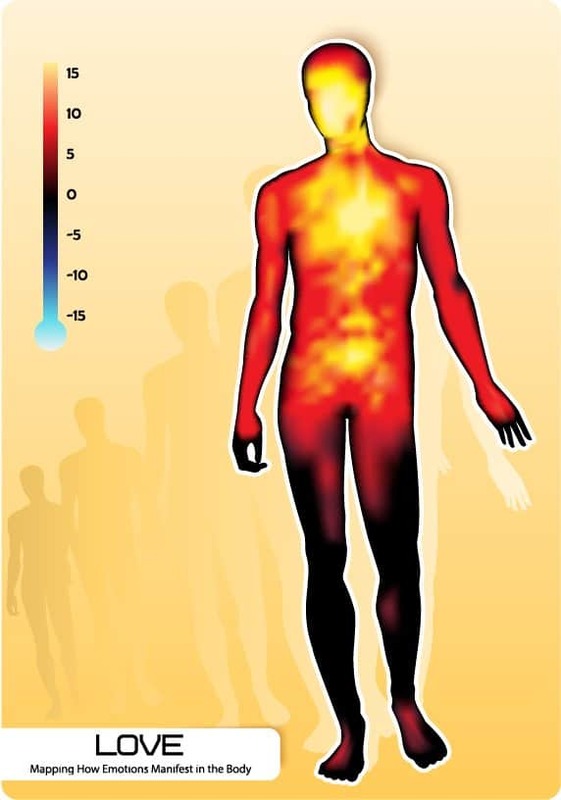 The authors stated that the results showed consistency across cultures, indicating that the heatmaps represent universal biological responses. 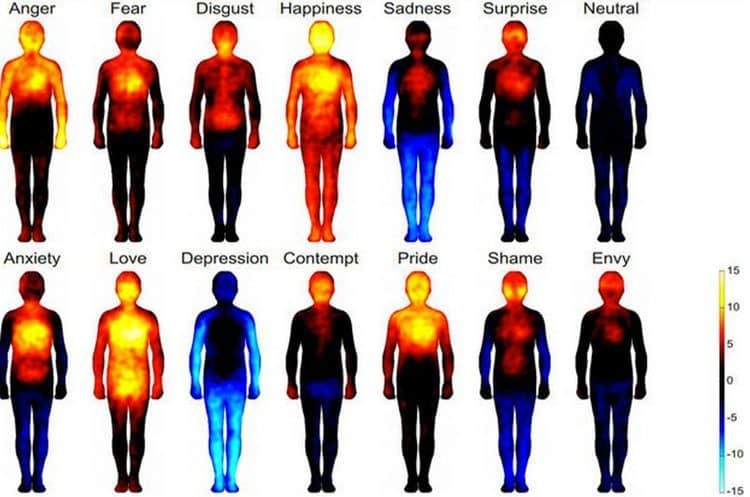 “Our data show bodily sensations associated with different emotions are so specific that, in fact, they could at least in theory contribute significantly to the conscious feeling of the corresponding emotion,” said Nummenmaa. These results led authors to speculate that how we perceive these emotions within our bodies might have something to do with how experience them, as well. So, this means that our awareness of our emotions as well as our conscious effort to feel certain emotions plays a role in how we feel them throughout our bodies. With that said, we have the ability to control our emotions to a certain extent. – Express your emotions; don’t bottle them up. Hiding your emotions can lead to things like depression, anxiety, anger, and other emotional problems. – Have an outlet for your emotions, whether that’s journaling, exercising, talking to a friend, etc. – Remember that emotions come and go. Don’t get so caught up in your emotions, but rather, allow yourself to feel them and then let them pass. Remembering that feelings are temporary can help you transmute negative emotions into neutral or positive ones. – Practice mindfulness to help you get in better touch with your emotions and feel more grounded in your day-to-day life.